As we made our way up the final stretch of the steep, gravel path, I gasped. There they stood, the mysterious, magnificent Torres del Paine, glowing a faint shade of red in the early morning light. There were about a dozen other people at the mirador as well, shivering in the frigid air and staring, speechless, at the beauty and splendor of this natural wonder. This was it. This was what I’d walked for five days to see. 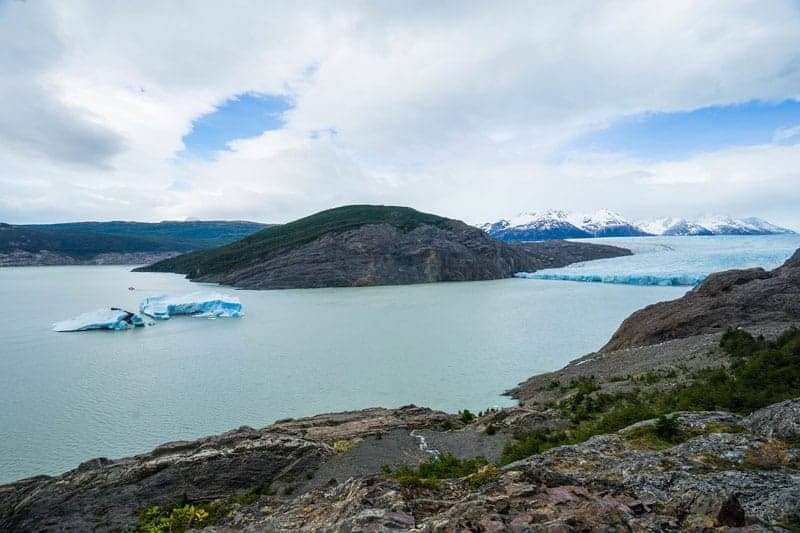 Ever since I began traveling solo, I’d always look at photographs of Patagonia’s jagged rock formations and stunning glaciers and marvel at their incredible beauty. For years, I dreamed of making the trip all the way to South America’s southern tip to experience Patagonia for myself. Last November, I bit the bullet and planned a trip to Torres del Paine, booked a flight, and packed a backpack. After taking two flights, two buses, and a catamaran, I finally arrived at the entrance of Paine Grande campsite to begin my 5-day trek. In the following five days, I experienced the highest highs, the lowest lows, and every emotion in between. I smiled until my cheeks hurt and walked until I couldn’t feel my feet. With no Internet in the park, I disconnected completely from the outside world. Moreover, I saw some of the most beautiful, breathtaking landscapes known to humanity, and left fully inspired by the spectacle of nature. …until I realized, after 30 minutes of walking, that my bag was really heavy. I didn’t know that it would take such an adjustment to be able to hike for hours each day with my big pack on my back. In the beginning, I’d take a bunch of brief stops to shift things around, trying to make carrying this giant backpack more bearable. To ease my discomfort, I took solace in the beauty around me. Since it was my first day in Patagonia, the terrain was quite unfamiliar to me. One minute, I’d be in a grassy valley, the next, I’d be walking along the side of a lagoon. Before long, I wasn’t even thinking about how heavy my stuff was; instead, I simply absorbed the amazing colors and scenery around me. About two hours into my trek, I climbed up a hill and found myself gazing at a monstrous glacier, situated between snowy peaks and a teal blue lagoon. The sight nearly brought me to my knees. This, I’d learn later, was Grey Glacier, one of the largest glaciers in the national park. I set my backpack down, grabbed my camera, and sat quietly in the presence of this amazing sight for a little while. The rest of the hike was a bit of a blur, as I huffed and puffed on a mostly uphill trail to get to my first campsite for the night. What rewarded me at the top, however, was a campsite with a truly stunning view. It was a well-received reward for surviving a challenging first day of trekking. I slept like a baby the first night, clearly exhausted after a nearly 4-hour hike with my large backpack on. However, it was time to return back to Paine Grande campsite (where I started my hike yesterday) for the next leg of the hike. Before I departed from the Grey campsite, however, I decided to take a few hours to hike around and get a closer look at the incredible glacier I’d seen from far away the day before. There was a mirador near my camp that I started at, finding a perch with a view and sitting to watch the clouds pass over the sweeping ice field. 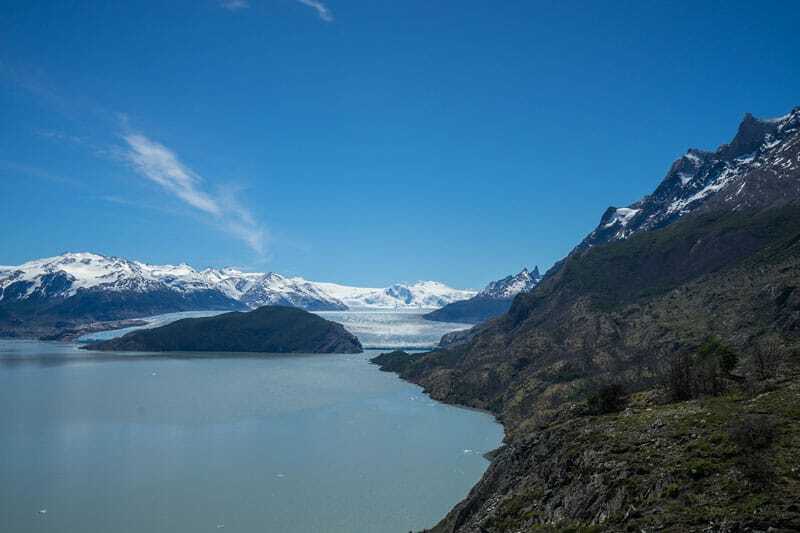 What saddened and surprised me was the presence of several broken pieces of ice floating in the lagoon, and the thunderous sounds of the glacier’s ice crashing into the water. 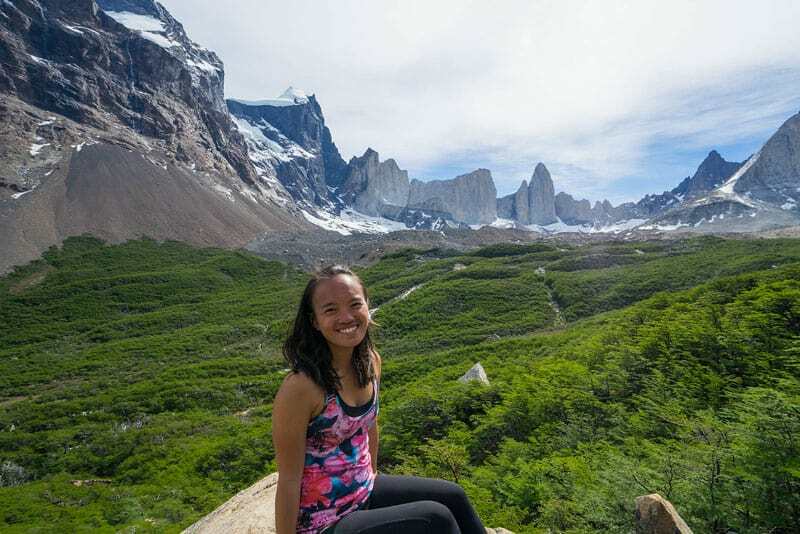 This was the first of many experiences at Torres del Paine National Park that really made me contemplate being more environmentally conscious in my personal life, and contributing to organizations that help protect these beautiful places. Next, I hiked a little bit around the side of the glacier to inspect it even more closely. I couldn’t get over how breathtakingly beautiful it was, with its blue-tinted ice, its expansive nature, and its calm presence between the towering rock formations at its side. The walk back to Paine Grande seemed a bit easier than before. When exploring the glacier, I ran into a Chilean guy I’d met in my hostel earlier in the week. He offered to walk back to the original campsite with me, and our conversation in Spanish helped me get my mind off the weight on my back and the hot, springtime sun. Even though I enjoyed the contemplative nature of my trek the day before, I enjoyed walking the 4-hour journey back with a new friend. On the morning of day 3, I felt like a million bucks. I woke up to the golden hues of the morning sun shimmering on the lagoon, and I emerged from my tent feeling rejuvenated. Everyone was still asleep at this time, their tents shaking slightly in the breeze. A small fox was prowling in between the tents, sniffing around but otherwise not making a peep. It was the perfect way to start the day: in the silent beauty of nature. A little while later, I packed up my things, now accompanied by my Chilean friend and a friend from home who’d joined me on the trail the night before. We set off for our next campsite in midmorning. It was a short few hours on the mostly flat trail today, and when we arrived at our next campsite, Italiano, I was giddy with excitement. 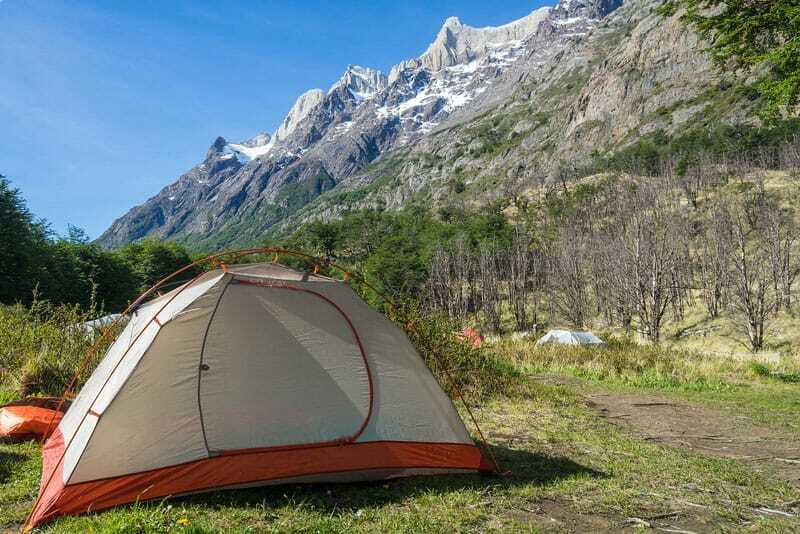 We’d been able to score the best campsite in the area, a wide space beside the river, with a direct view of the Paine Grande mountain and glaciers. We pitched our tents happily and smiled at our top-notch accommodations with a five-star view. In that moment, there was nothing more luxurious than the cool, fresh air from the stream and the beauty of the world around us. Little did we know that the best was yet to come. After a quick lunch and siesta, the three of us set off for a hike to Mirador Britanico, an amazing viewpoint in the Valle de Frances. Since we didn’t have our big packs on, the hike was much more manageable, even though it was much, much steeper and technically more difficult. We passed many large boulders, babbling brooks, and scorched trees where there had been wildfires before. Once we passed the final, extremely difficult rocky pass, we arrived at one of the single most beautiful viewpoints I have ever experienced in my life. Everywhere the eye could see, there was something beautiful to take in. Towering, gray rock formations loomed above to my right. The verdant evergreens flashed their emerald hues in front of me. And to my left was a striking view of Lago Nordenskjöld, its teal glacial waters sparkling in the afternoon sun. There was no way to capture it on camera, so after a few fruitless attempts I put my machine down and attempted to take it in with all of my senses. I couldn’t believe a place like this existed. I was humbled and floored by its splendor and magnificence. Having fallen asleep to the soothing sound of the river flowing outside my tent, I woke up feeling extremely relaxed and refreshed. However, I was anxious because today’s hike would be the longest so far, with my full backpack the entire time. I vowed to be kind to myself and take breaks as needed, but I knew that it would be a tough 9-10 hours of hiking ahead. It started off as usual, as we passed through beautiful fields next to the bluest water of the lagoon. We stopped for a brief lunch at Los Cuernos campsite before tackling the longest and most grueling pass yet. After 8 hours of hiking, I felt fatigued and frustrated at how heavy my bag felt, how hot the sun was, and how much my feet ached. It was a huge lesson in powering through and getting over the mental and physical hurdles of this intense hike. At one point, I sat down on the side of the road, in tears, unwilling to move any more. Just like traveling itself, my Patagonia hike wasn’t always glamorous. My friend assured me that it wasn’t much farther, but I couldn’t get over how much my body hurt. Finally, in a last-minute burst of anger and adrenaline, I stood up and charged forward until we reached our last campsite: Chileno. Here we’d signed up for the meal plan, which gave us a well-deserved break from cooking our own food and washing our own dishes. 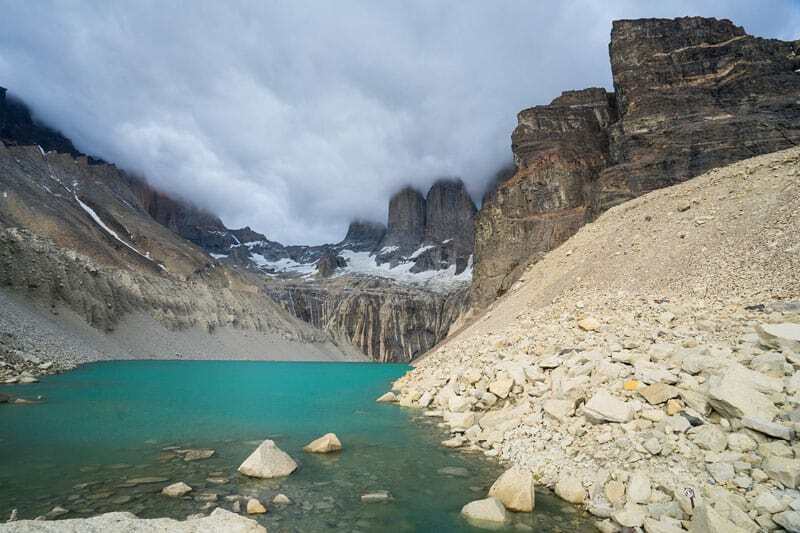 I slept early to prepare for the final ascent of the trek: the hike to the Torres del Paine mirador – the place I’d been dreaming about all this time. My alarm was buzzing but I didn’t want to move. Finally, I checked the clock – 3:00 AM. 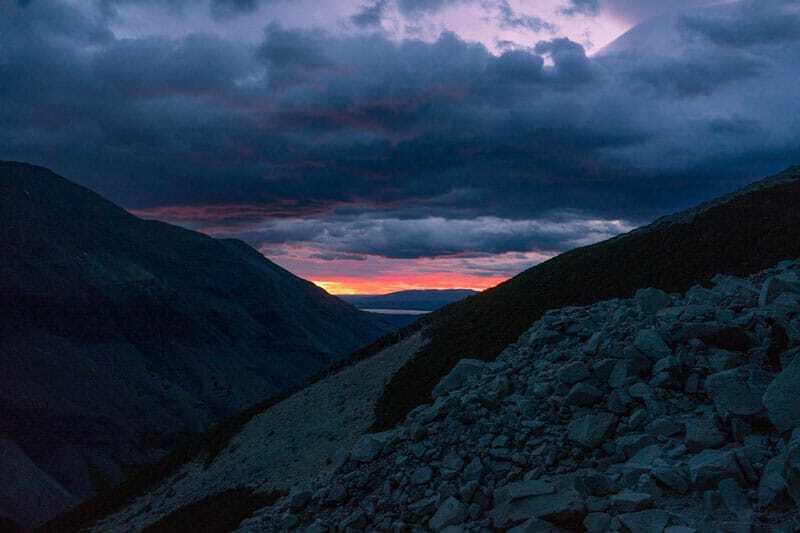 I rustled around the tent for a few more minutes in the dark, attempting to find my headlamp and prepare for the 1.5-hour hike to the figurative “summit” of the trek. 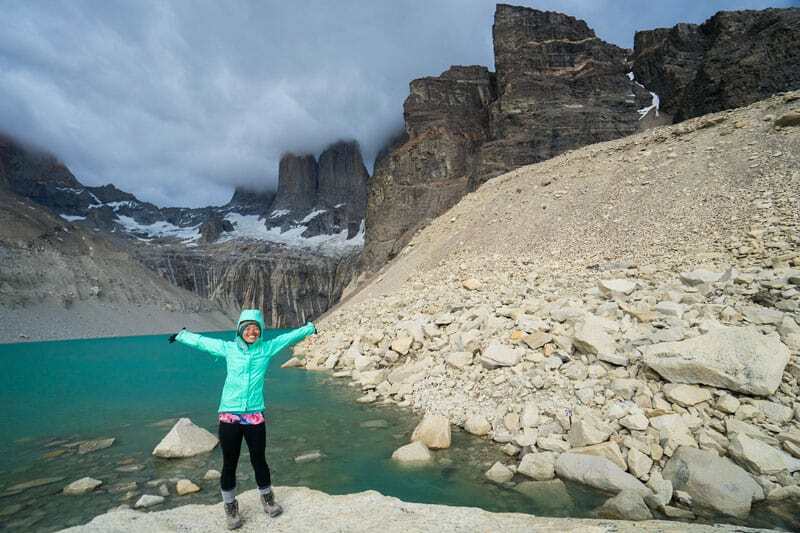 Finally, after about half an hour of packing up in the dark, my friend and I were ready to tackle the final climb to Torres del Paine, the namesake of the national park and supposedly one of the most beautiful views in the entire world. The stars twinkled above us as we made our way through the forest toward the mirador. Although it was still dark and frighteningly silent, there were a few other groups of people making the ascent as well. After about an hour, we arrived at the base of the final stretch – an incredibly steep, gravel trail to the viewpoint. My friend and I high-fived each other and tackled the last bit with excitement. As we neared the end of the trail, the Torres started to come into view. The faint red of the morning seemed to paint the rocks like watercolors, in contrast with the teal of the glacial lake below. We sat on a rock, awestruck at the amazing sight before us. We were here. We were finally here! I couldn’t believe that nature had crafted such an incredible rock formation. It was like something out of a dream. We stayed at the mirador for over an hour, walking down near the lake, scaling boulders, trying to take in the Torres from every possible angle. I swore to myself that I’d come back once more in my life to experience the strong emotions and beauty I’d experienced that day. Finally, the clouds started to cover the Torres completely, and we decided to say our goodbyes and make the descent back down to the campsite. Taking on the challenge of trekking for five days was transformative for me for many reasons. I learned that I can power through any situation if my mind is determined and that my body is a lot stronger than I give it credit for. Also, I realized that I get a lot more thinking done when I’m disconnected from the distractions of my phone and the Internet. Additionally, I learned that there is no greater bliss than being completely surrounded by nature, breathing in its fresh air and taking in its sights. Since returning from Patagonia, I’ve started figuring out ways I can live a more ‘green’ lifestyle, and I’ve began to support organizations that help conserve national parks and minimize the effects of carbon emissions. 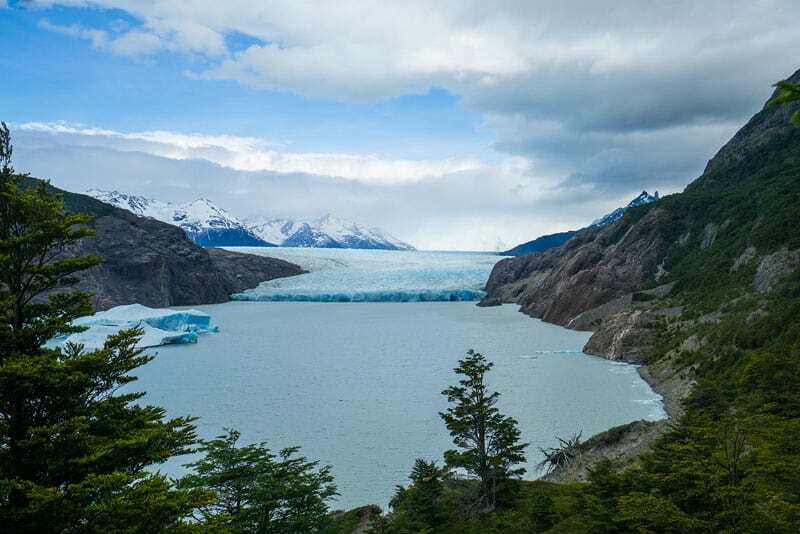 I’ll be back in Patagonia one day, and until then, I’ll have the stunning photos and the life-changing memories to remind me of my incredible five days there. 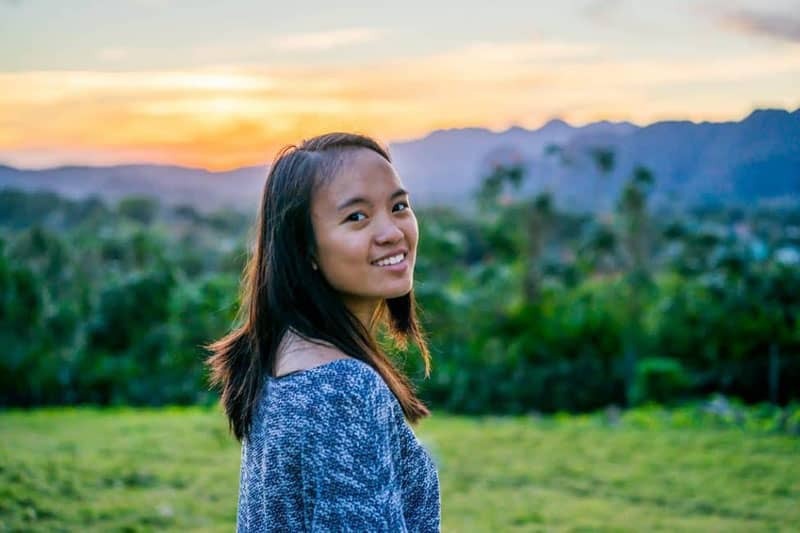 Kay Rodriguez is the writer behind The Kay Days, where she shares her stories, photos, and advice in her quest to visit the world’s most beautiful places. Based in Houston, Texas, she travels as much as she can when she catches a break from her full-time corporate job. Check out more of Kay’s adventures on her blog or on Facebook, Instagram, Twitter, or Pinterest. 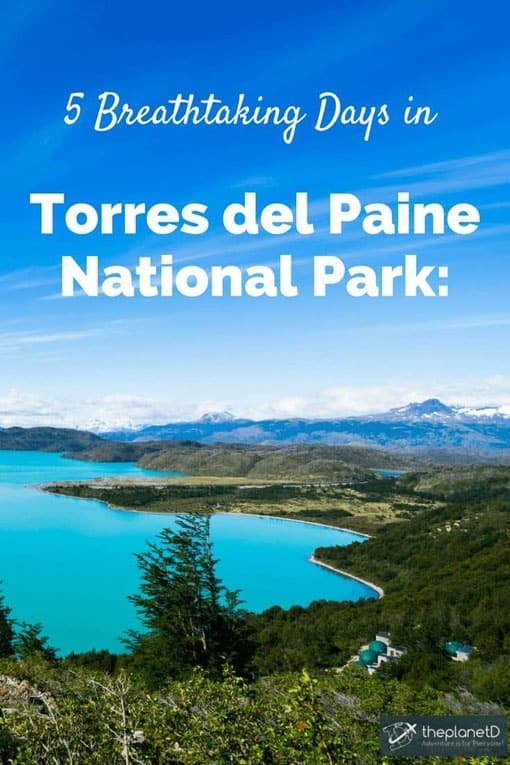 17 Responses to "Torres del Paine National Park – 5 Breathtaking Days in Patagonia"
What a great achievement! 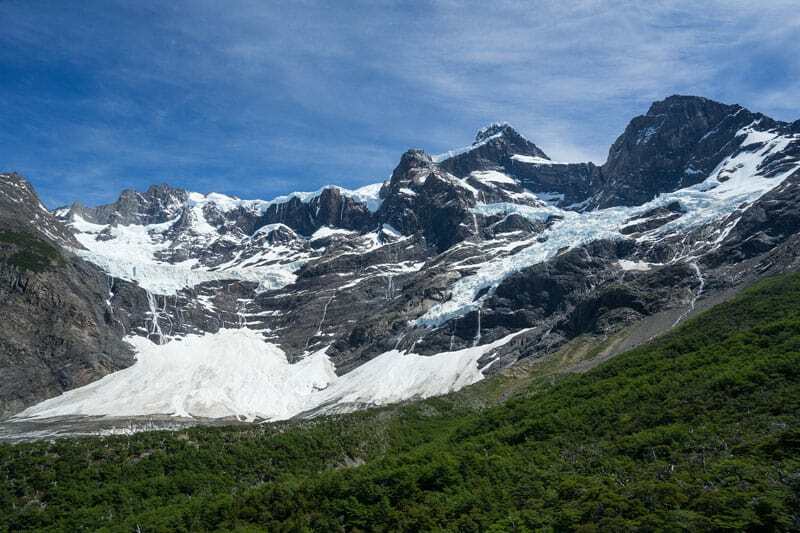 We just returned from Torres del Paine, but we did day hikes in the park. Staying in tents and refugios didn’t seem too appealing. I wish we were younger and could do the entire W circuit. In case you go though the Chilean side, from Punta Arenas to Puerto Natales There is an AMAZING store in PUNTA ARENAS that carries everything you need to survive Patagonia in case you miss something and or need some local info of everything!! MOUNTAIN HOUSE is the name and you can look at it on facebook or Instagram or just go to Mountainhouse.cl is located in Punta Arenas downtown. Thanks for sharing a nice post. These pictures are obviously amazing. Really Torres Del Paine is a gorgeous place. 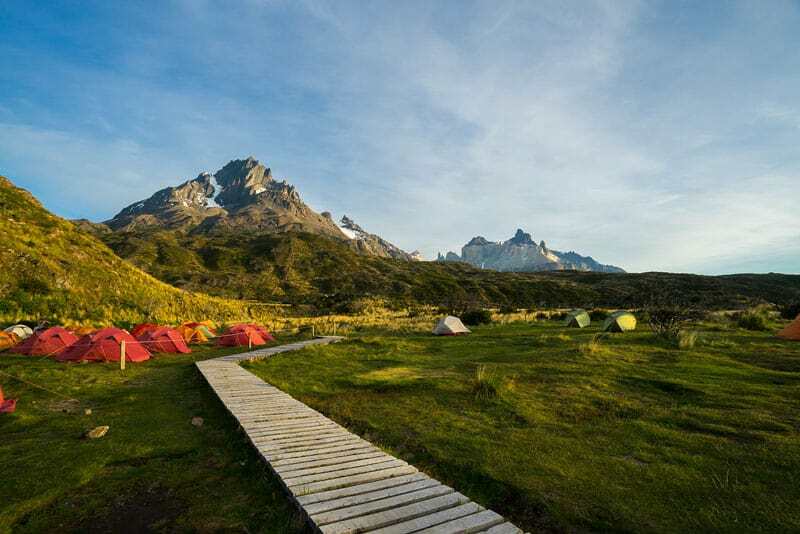 The famous W Trek in Torres Del Paine is the perfect destination for the adventurous traveller. The park is becoming a very popular hiking destination, and accommodations fill up fast. 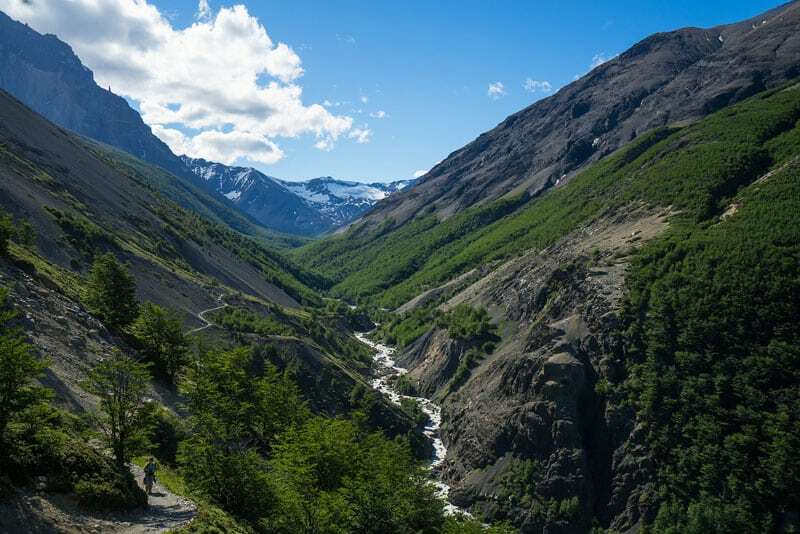 This park is the most visited hiking area in all of Patagonia, and hoards of trekkers come here each season to experience the unbelievable natural beauty of this park. We just hiked the W trek a few months ago with ChileTour Patagonia and had such a great time! Really this place is so beautiful and attractive that was beyond my expectation. It was an amazing trip for us and we enjoyed a lot. What a fabulous account Kay, truly inspiring! 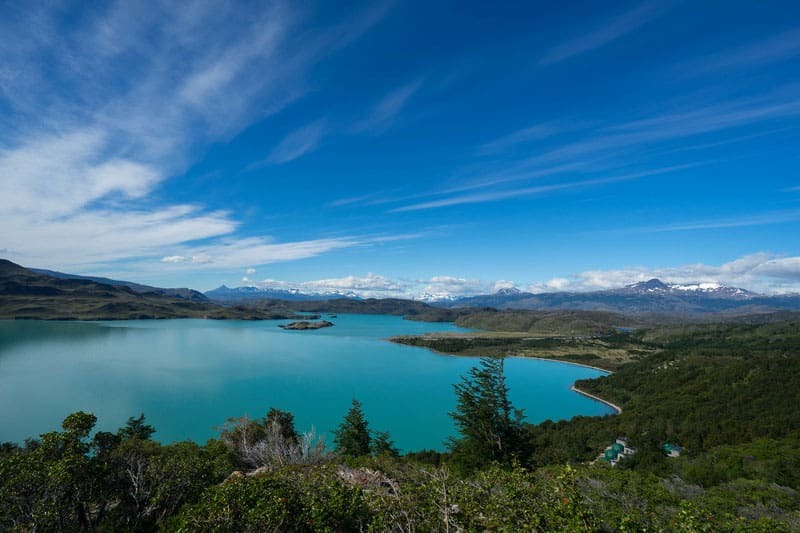 Thank you – Torres del Paine is truly an incredible place! Wow !!!! thanks for sharing your dazzling tremendous photos. 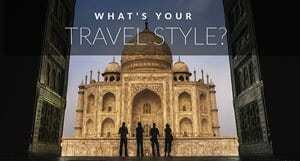 After seeing the photos I am eager to see those place which you have mentioned. I always love to visit new places & I don’t have any idea about it. Previous month we had gone to Rockies mountain tour with USA Travel Online which I never I forget. Definitely one of the most beautiful places in South America…Amazing photos! Spectacular photos, definitely one for my bucket list! May I know if there was a marked trail to follow, and was it easy to navigate around the national park? 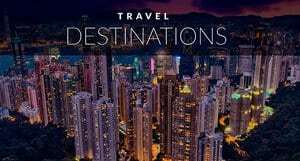 South America is a real bucket list destination for me – so posts like these are so inspiring to continue to motivate me to save the money to visit. From Australia it is a long way and quite expensive so just takes time to put the money away. This is such a great place with the hilarious nature inside, I have enjoyed by the pics.Like to go that place and enjoy in real.Soon it will happen. The place is so great with hilarious nature with it.Soon I will to this place. Incredible pictures, and the story-telling is really inspiring. South America is just an incredible continent, and in many ways mirrors the huge variety of climates and terrains that we see in the States. It’s really jarring to go throughout the continent and witness some of the beauty! Wow!! what a location. 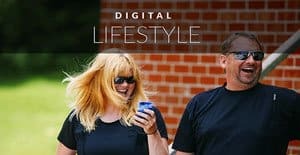 I really enjoyed while reading this blog. Thanks to upload the alluring photographs. Wow! I am simply stunned by the pics, how I wish I could visit this place at the soonest. Thanks a ton for sharing. Loved it! Lovely read and stunning pictures. Nature seems to be at it’s best. I am sure you must have had the best of your time in this adventurous place. Thanks for sharing! What utter tripe. You do realize half the planet was under ice (or extremely.dry desert) just 20000 years ago? 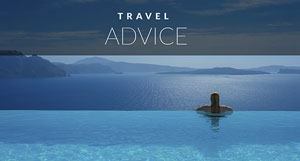 Oceans were 400′ shallower. We live in a Golden Age where Life abounds! Be thankful.the glaciers have been retreating for millennia.